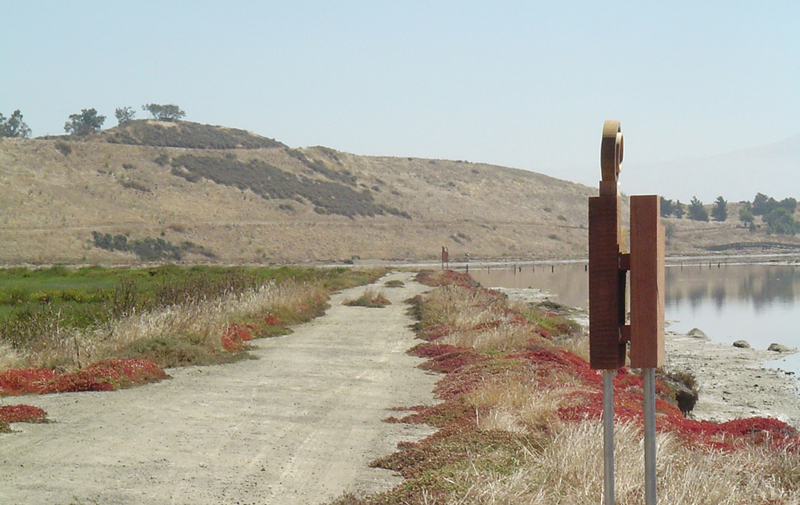 Interpretive Trail for San Francisco Bay National Wildlife Refuge – Sorensen Partners | Architects + Planners, Inc. Seven human-size bird ‘totems’ built of Redwood, Guasivan, and stainless steel tube line a five-mile levee trail that journeys dramatically into the center of the San Francisco Bay. Depicting characteristic behaviors of bird species important to the Refuge (species were selected by naturalist staff), the totems and an accompanying guide engage visitors by teaching them about the birds’ behaviors, environment, and the challenges they face from encroaching development. Each bird’s ‘eye’ is a viewing portal, allowing a look out over the refuge from the bird’s perspective. The size of the totems is intended to encourage visitors to think of the birds as having a human-size importance. This trail furthers the Refuge’s educational mission and sits discreetly on the land, maintaining a respectful relationship to the protected wildlife area. In order to reinforce the link between the abstract and the actual, the guidebook contains images of the totems alongside realistic illustrations of the birds, accompanied by poems written in the first person from the birds’ perspective.